Kids chatter. This is my life as a 9th and 10th grade teacher. They chatter incessantly. It drives me crazy. That’s who they are. So we move on. But I’m not looking forward to this lockdown drill. I’m in another teacher’s classroom supporting and this group tends to be extra chatty. Now we have to block out the light, sit on the floor in the corner. Silently. I know this is impossible and I never feel good about having to do impossible tasks. It feels like a set up for failure. I also have no interest, not this time, of explaining why being silent is so important. That if someone sneaks into our school and is ready to attack we want the person to think there is no one in this room. This room is not being used right now. You should just keep on walking and shoot someone else. It is not worth your while to try and look for us here. Go shoot someone else. I am NOT dying today. No, sir. This almost strikes me as amusing. In our tiny school. In this even tinier classroom, that was carved out of an actual classroom split into two there is no space that is not used. Anyone with a personal vendetta from our school knows that. We are fooling no one. And anyone from outside of our school family… Well, if they skipped us, then they would get somebody else. We are packed to the brim. Any bullet shot will hit someone. But our goal, at least at this moment, is to be so still and silent that the shooter does not recognize the existence of humanity in this room and moves on. Survival of the fittest. Or at least most silent . . . It has been 42 days since a student of Stoneman Douglas High School walked into school with an AR-15, not seeing the humanity of his fellow students-- and my guess, of himself-- and shot 17 people dead. The school had no metal detectors. The school had a scared security guard. The school was not used to this type of violence. So 17 people, ages 14 to 49 lost their lives. And the students decided to speak up. They, in fact, got the attention of the world. 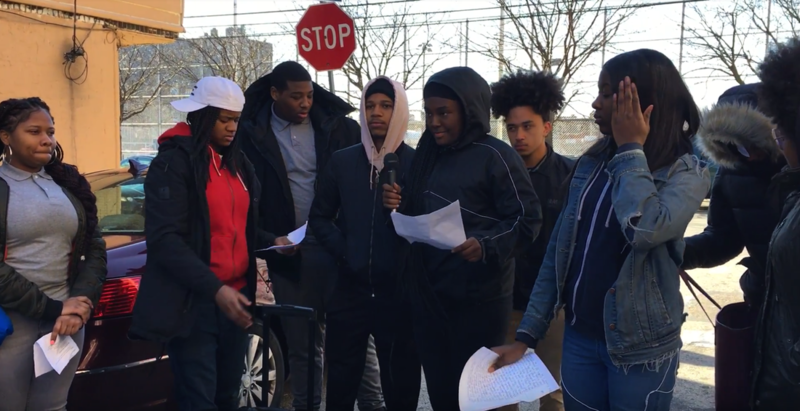 In Philadelphia, in our tiny school, students recognized their screams. They knew this pain, of losing life too young, of witnessing senseless violence and trying to make sense of it. They already had been writing poetry about loved ones lost, writing essays about gun control, conjuring images of dead bodies, lost to the long-term effects of slavery and capitalism. They had already screamed Black Lives Matter and watched more young, Black lives inked out repeatedly. They were ignored. Yet, they chose to speak again. Parkland students called for a nationwide walkout on March 14th against gun violence. Our students recognized this call. They knew the words and feelings intimately. So they organized. As a teacher, I have witnessed the pain pouring from their pens and wanted so badly for them to take action. I have felt impotent at asking them to take action in the face of all they face daily. But this time was different. I gathered in the room as students had a lunch time meeting. Not to teach or lead, but as an ally to them and their cause. I listened as they summarized the messages they wanted to share. I took some notes while they spoke. I listened. Days later I rolled our PA system out to the front of the school. My job was to charge it. I dropped the mic into one of their hands and saw their words float to heaven, a hundred angels soaring straight upward, gathering with a million other voices. I am not a religious person by any means. But I heard these words and they were nothing less than prayers and pleas for change. They sought out something within all of us--but especially within our nation’s leaders. I think they sought humanity in some of the darkest places I have had opportunity to witness, in the minds and hearts of politicians, of adult leaders, of us, those who have let them down, left them to die. And the emotions I felt when their peers rose up from across the world and gathered together in Washington, D.C.--and Philadelphia and New York and San Francisco and London. I was filled to the brim and overflowing as Emma Gonzalez made us wait for 6 minutes and 20 seconds in silence, the amount of time it took to erase 17 lives. She made us feel every second with all of the embarrassment and fear and waiting, just waiting. Hearing gunshots ring out but just waiting. Watching lives drop from existence but just waiting. Having no way of knowing when this horror story would end, she made us wait. And today I find myself waiting in a different kind of silence, with twelve 9th graders in a landlocked room, a window to the hallway blocked, door locked. They knew it was a drill and settled immediately. And all of these thoughts and feelings flooded to my mind, how we have taught them to be silent, taught them to be still. We have taught them to have the cool, calm, collectedness of a soldier prepared to die. I never reprimanded one student for chatting. Not one did. We waited. My heart dropped. We have prepared a generation of children to be silent, to wait out the chance that they will be killed by a gun, in their own schools, in their own communities. We, as a nation, refuse to change the conditions of their lives. We make them wait. We make them count the 15 years of Tyhir Barnes’ life until he dropped before us, another life taken. We make them count the 12 years of Tamir Rice’s life before he is shot in a park. We make them count. 1, 2, 3 . . . 629 teenagers killed or injured by guns in 2018 alone. We make them mask the presence of their humanity until the danger has passed. It never passes. It will not pass. Not until we decide to change. We cannot be the ostrich with its head buried in bloody money, pretending that we don’t see our children dying. But, if we decide to wait, let it be as painful as watching Emma Gonzales watching us, feeling the echoes of our babies dropping to the ground, hearing the bullets ricochet through a generation who is desperate to live and whom we are desperate to ignore. This appeared outside once Bok came under new ownership. Why does it have to look so much like kids' building blocks? On rainy days, the ceiling of my classroom leaks. My students and I know just how to rearrange the room and just where to place the bucket to accommodate the steady drip. It has been leaking for six months. Last week, the handle of our classroom door fell off. After a few instances of near-panic, when we were momentarily locked in the room, I realized it won’t be fixed in the near future. I taped down the latch. For over three years, the toilet in our girls’ bathroom was broken, wrapped in a trash bag. This year, someone on our staff finally broke down and hired a private plumber to repair it. In the School District of Philadelphia, broken things do not get fixed. You can put in a work order, but except in the most dire situations, you’re better off inventing your own solution than waiting on the District to send out a maintenance worker. Still, my school is one of the places where I am happiest. It’s where my work is. It’s where my students grow up—from nervous 9th graders to self-assured seniors—and where I have grown into the teacher I am today. It’s where I can count on warm greetings, tough challenges, and earnest support from just about everyone. And despite its hazards, it’s one of the safest places I know. It’s our home. On my drive to school each morning, I pass the old West Philadelphia High School. The looming gothic building is gradually transforming from a historic school into luxury condos. I watch graffiti disappear from the walls and young trees appear in freshly poured sidewalks. The place buzzes with investment, with the anticipation of value, even on rainy days. In my neighborhood in South Philly, I sometimes pass by the old Bok High School. Another looming stone building, bereft of students, Bok closed in 2013, along with 22 other schools. My friends rave about the views from the new rooftop bar, but I am scared of the ghosts. In both cases, private investors initiated major upgrades that the School District could never afford. With over thirty percent of Philly’s students now attending charter schools, the District does not have the funds to maintain its schools. So it has sold many of its older buildings, in order to pay the charter schools, which move into new buildings, often at outrageous cost, in order to attract more students from the District. Meanwhile, Bok Bar and West Lofts are enjoying excellent returns on investment. The cycle is maddeningly inefficient and financially disastrous, with private interests exploiting our teetering funding structure for public schools. I cannot imagine how this two-tiered system of schools will sustain itself. Instead, I hope that charter school teachers and public school teachers will begin to work together to demand more funding, transparency, and accountability of our leaders. We will certainly need to be organized in order to withstand the latest attack on our brick and mortar—cyber schools. ​The night before the school year is about to start, educators have only one life saver in our sea of anxiety; there is almost always an inservice or professional development a few days before the students arrive. In that final week, as we can practically hear our summertime recess clock ticking it’s final seconds, many of my colleagues and fellow educators dive into a period of deep reflection and we incessantly make promises to ourselves. We hope and recite that this year will be easier, and that reciprocity and gentleness will flow from our students and school administration more plentifully than the many tasks we are given. We promise to be gentle with ourselves and have a renewed passion and energy for our course design, field trips and instructional plans. However, within a couple of days of inservice and professional development we are compelled to swiftly alter our resolve as we must meditate or pray for the serenity to accept the things we can not change about our school systems. Indeed we find out that there are some things we can not change no matter how logical or beneficial to the students that change may be. We can argue, show research that proves our correctness, or beg, but small class size and a teacher’s student load is never considered by some of our schools administration when discussing enhancement of instruction. We find out or reaffirm that the true educational growth a school desires for its students is relegated to a mission statement to lure parents and appease communities. At the same time, we know we can’t change our school policy makers’ misplaced obsessions with standardized tests. We can’t change the fact that often teachers are put under a surmountable pressure to “pass” failing students or that teachers are often punished for demanding work ethic and effort from our students. We can’t change the fact that students come to our class completely unprepared with the basic skills needed to produce in our class. We can not change the fact that our profession as educators in the United States is given no reverence. We can not change the fact that educators are often seen as expendable caffeined chattel by school systems and that there is no such thing as a teacher having a family or any life outside of their educational duties. For a teacher to demand time to rest, be with family and enjoy recreation is sinful and is seen to surly diminish the education students deserve. We can’t change the fact that teachers are hardly ever consulted about designing a class, even if they have proof that the design will be effective. Although teachers are key change agents of a community, we are often discouraged from offering any real input and designs for educational or pedagogical practices. Course autonomy and respect for our expertise in instructional strategies is utterly non-existent in most school systems. And no matter how loud the opportunity gap or academic performance deficiency is , the educator’s opinions and expertise on how to mend those gaps is often dismissed and in some case not even welcomed to be voiced. The summer recess of a teacher is spent participating in revitalizing activities be that a margarita at the beach or a professional development opportunity! We are fortified and encouraged by our successes of the previous school year and haunted by our failures. At the onset of the school year that starts with in service responsibilities or professional development, educators seemed plagued with a summer glow, resident smile and exciting plans engaging young people. But then we are smothered with the anxiety of all of the things we can not change or even influence in some way. How do we keep that renewed energy and passion for our course design, instructional strategies, and student engagement? How do we keep a resident smile and summer glow all year in spite of our hopes and dreams for our students being undermined by administrative practices? The following are a list of promises that I have made to myself over the last 7 years of my 17 years of teaching. It took me a while to learn that these are the only real promises I can keep to sustain myself. 1. No matter how frustrated you get, STAY SOLUTION ORIENTED !!!! First, know that you are not alone in your frustrations and sometimes utter disgust with what we see as injustices towards our students. These frustrations can range from the injustice of not having a registered nurse full time for students who absolutely need their services to having to buy your own supplies just to have the basic needs any educator would require to do the job. While it is important to lean on, cry, vent and have an “amen corner” in your colleagues, it is your duty to create solutions and innovate practices to minimize these frustrations. Even with your colleagues problems, after intense listening, try to offer a solution. Being in the habit of this creates an empathetic working environment and creates a deeper rapport with your colleagues. We are educators. Our jobs require constant innovation. We must use that constant practice of being instructionally innovative to give us confidence in creating solutions for problems we can not control. This sometimes requires we educators to be somewhat rebellious or discreetly insubordinate, most especially when we are held to a uniform curriculum that does not allow for teachers to create lessons that respond to how her students are truly engaged. When you close your classroom door ALWAYS make sure that the learning environment belongs to you and all that your students’ need to learn and stimulate their interests in learning. Your classroom, your students and your ever evolving and responsive instructional strategies do not belong to district mandates. They do not belong to your principal’s mandates. They most especially do NOT belong to some corporation’s successful bid to mandate a uniform curriculum that they convinced the school system to buy. I tell all first year teachers that I have mentored that when you make your classroom yours and your students, everyone and everything else will work itself out, most especially when you focus on be responsive to their academic needs. In short, “always ask forgiveness and never permission” Your students will know you as their advocate and will always help to sustain your declarations of instructional sovereignty! Being instructionally effective comes with a wide range of challenges including school policy makers lack of focus on deciding what’s best for maximizing a learning environment for students. So when your principal proudly announces that your school will be receiving 500+ more students, know that you’re right to be still emotionally tangled. You are right to worry about what that means for your new student course load. True, there may not even be enough seats for each student to seat themselves, but try to open up your classroom space as much as possible. Indoor plants help too, especially since oxygen and peace will be most sought after! Another solution would be to see of you can balance the student load with a common content colleague, if they are not overwhelmed with their classroom numbers as well. The most powerful solution to this sort of problem is to try to encourage the parents of our students to speak out against these practices. All and all, we rely and must rely on our colleagues to solution storm inside and outside of district mandates that may hinder our instructional effectiveness or enhance our stress level. 2. Do not fight battles and whole wars you can not win! Beyond fighting the insanity of some decisions by school policy makers, some of our battles are with our students destructive habits and disengagement in our classrooms. Just like fighting school policies you can not change, fighting or spending too much time focusing your attention on a student’s undesirable behavior is a robbery to the 29 + other students’ needs and academic growth. If the school does not have a strong enough policy to enforce certain behaviors or academic accountability, then educators have no choice but to document accurately and reprimand the student quickly, almost as just a reminder. For example, the educator’s battle with student cell phones is very real. No matter how many studies come out to show us how damaging and distracting the cell phone is in class, you will have some parents that argue for student rights of personal property and that is why some school policy makers concede to that right. Frankly, if it is not a battle your school district or school is willing to get into, then you must look to the small victories that exist in record keeping. During report card conferences, it may impress a student or their parents to see the number of days their young person was distracted by their cell phone per the number of days that exist in that quarter’s marking period! 3. Teachers gotta have a life too! Our health is truly our wealth . . . and our students’ wealth too! I have been a teacher for 17 years and in that time I have attended 4 funerals of educators who died due to failing heart conditions and high stress levels. You would think that would make school policy makers reconsider the ever mounting workload that is placed on teachers. But it will not. We have to do that for ourselves. No one is built to teach all day, deal with and redirect student behaviors all day, lesson plan, and then come home and grade papers all night. If you want to be a better educator, you must remember that you are a human being and you need time for rest and recreation too. Here is a list of things I commit to every week during the school year that may help you. Do I keep to it every week? No. But it is an anchor for me and helps me to have optimum energy for facilitating instruction. Make sure that 3 to 4 times a week you spend on some sort of cardiovascular fitness. This includes dancing! The most successful and enjoyable way to apply this is to create a walking, line-dancing, or joggers groups with your colleagues or content team! At our school, the English teachers meet every school morning , 30-45 minutes before school is about to start to walk a mile or two. During this walk we just talk about anything we want to talk about, usually nothing too serious. For those of us that are not morning people, we also have afternoon sessions. One to Two days a school week, go straight home and do nothing to do with school. Don’t worry the work will be waiting for you when you get back and you weren’t going to finish reading and grading all 150 of those essays anyway! Spend time with your family and loved ones. They need you too. Make sure you take naps when you can. Get plenty of rest. 4. Do not “pass” a failing student. Let the admin change grades if they want to. 5. If you are not enjoying what you are teaching, change it! Your job is to connect with and engage your students which is impossible if you are not into what you are teaching. Within optimum instructional autonomy, as long as you are focusing on the core standards and a clear objective, there is no opposition to you being creative and even re-writing the curriculum. For example, when I was forced to impose this scripted, direct instruction, phonetic awareness drill on my 8th grade students, my students were not only disengaged but they began to hate reading. Every morning, for the first hour, we would do call and responses of random phrases to practice reading aloud. Although the students, I worked with were reading below grade level, they did not need to be tortured with rote practices that most especially turn students off from seeking literature. I decided to rebel and changed my class into a class we called “The Literary World of Music”. Every morning started with a song chosen by me and then Fridays the students could select our Monday song. We would read the lyrics and have dynamic discussion on the meaning of some of the lyrics. We would analyze the use of literary devices and figurative language constantly. Gradually, I would add some poetry or an intriguing short story or article but we NEVER went back to that scripted curriculum again. Reading levels absolutely improved and more importantly, my students learned to have a love affair with literature. 6. Develop partnerships and good collegial relationships with your colleagues. Be it your content area team or your colleagues that share your students with you, often we are all we have to sustain us. Isolation is the worst habit of some educators and it does nothing but reduce morale and make one feel as though they are all alone to face the constant challenges we have as educators. 7. Create a positive jar or journal. Write down 2 or at least one positive thing that happened per day. On bad days go back and read some of these journal entries. Here’s the truth about teachers who love what they do. One teachable moment can cause us to chip off resolutions 2 and 3, easily! Those 2 out of 7 resolutions focus solely on the well being of the educator. By October, most of us have forgotten it is okay to want to just go home after school or, dare I mention, use a personal day! Many people binge on Netflix or mac and cheese as a way of experiencing a pleasurable and cozy sort of comfort. I binge on those things too, but I am also a teacher who binges on education research conferences. Some may groan at the thought of attending a research conference. Many may critique these events for using inaccessible language and being soporific experiences. However, I am drawn to these conferences because, like comfort food, they bring me joy. Sitting in a room where lots of thoughtful researchers are trying to puzzle out the fundamental tensions and problems of teaching is exhilarating. It can feel as if you are right on the edge of solving some big issue in your classroom, your school, or your nation. I have become addicted to making sure that I can hear--and be part of--the conversations that academics are having about our classrooms. My first conference was the National Council of Teachers of English annual convention nearly a decade ago. I went with two colleagues and at first we went to some really terrible sessions where presenters would get up and lecture for the entire time about a short story that they taught one time. They would recount the plot of the story in tedious detail but never actually offer any ideas about pedagogy. But then we started going to sessions marked “research strand” or to see people who colleagues had recommended. And the world opened up. Suddenly, we could tell that there was a sustained conversation going on with a particular group of people about what English was and should be in high schools, about what audacious things students knew and were able to do with literacy, and about how social justice and systems of unequal power played into all of this. Suddenly we felt awake. I remember one of my colleagues asking, “why isn’t this room packed? Why isn’t everyone here?” as we listen to a researcher unpack issues in students’ reading comprehension over time. As we sat in this session, we were forced to think about the ways that our classroom talk before and after reading might build reader-identities in students and ultimately make our students more or less successful readers of school texts. For example, starting the class saying “open the text to page 200 and read the first paragraph” could potentially have a very different effect than saying, “yesterday’s reading made us question what it meant to be an ethical person, and today we are going to get to explore this thorny issue even more deeply.” The first way of opening the lesson assumed an ideology of compliance—the statement is a command and all personal pronouns are stripped away. Further, there’s no guiding question or reason for reading embedded in the statement. However, the second way of beginning the class uses pronouns like “we” and “us” to build the shared class community. It employs words like “yesterday” and “today” which situates this lesson as a step in a larger arc. And this opener ties the text to cognitively demanding and engaging tasks—puzzling out what constitutes an “ethical person” which is seen as a “thorny problem” without clear right/wrong answers. It sets students up with a guiding purpose for reading and invites them to do intellectual work. Obviously, the way you frame a text before reading is not alone going to magically make everyone read perfectly. We still need the scaffolds, graphic organizers, and other supports as we go through the reading process. But listening to this talk at this conference made me forever shift the way that I teach reading. It made me realize that the language of the lesson matters and that how you frame reading experiences set students up for success or failure before any eyes even glance at text. Attending this session made me a better teacher and made me so excited to be thinking about my practice in this way. I remember sitting in the audience and madly scribbly notes to the colleague next to me—notes filled with exclamation points and emojis. Attending that session was such an enjoyable experience that I never stopped conference binging. My colleagues and I go to several conferences each year and we still sit next to each other and wildly scribble notes and questions about our practice of teaching. Sure, we end up in some bad sessions sometimes, but we have gotten better at knowing how to pick sessions that will temper our insatiable curiosities. As time has gone on, we have more and more wanted to not just listen to the conversation that researchers are having about our classrooms, but to also be part of that conversation. We have conducted our own research projects and been presenters ourselves at the conferences. Unlike binging on mac and cheese or Netflix, which are primarily about consumption, conference binging has also become about production for us—as we actively try to help produce answers to some of the thorny questions and dilemmas of our professional practice. And while some may still find conferences useless or boring, for us a conference always brings excitement, practical ways to improve our teaching practice, and unbridled intellectual joy. This is a piece that Stacey wrote in spring 2017 and shared with our group in May. It’s the time of year when baby birds fall from nests. You’re walking along the city sidewalk, lost in your thoughts about the day ahead or the day that’s done, and there, a step ahead, lies a fuzzy broken body of potential, gone. Light, extinguished. You wonder for a moment how this fragile fledgling fell, what series of events led to its death. Was it the accidental knocking of a sibling’s naked wing? Some sloppy, inefficient predator? An overwhelmed mama bird driven to desperate infanticide? Or is it just something that happens. One of a statistically predictable batch of baby birds that just don’t make it. We accept these deaths because the majority--those with better built nests, access to more nutritious worms, protection from bored cats on afternoon joy rides--they survive. We don’t remember the hollow skulls smashed against the pavement because we see the survivors flying high and free above our heads, and we maybe even envy them their freedom. So we step over, and we keep walking. It’s no small coincidence that this is also the time of year when the reckoning comes for many of our high school seniors. Unexcused absences, chronic tardiness, messes of missed homework assignments and failed assessments can no longer be ignored or promised away. The numbers speak, and they say to our students in no uncertain terms that they didn’t cut the muster. They aren’t, apparently, College and Career Ready. And we sit at tables and talk about why and how. We blame them. We blame ourselves. We blame the system. Black Lives Matter, right? Make America Smart Again, right? But we’re exhausted. We’ve all been doing our best, even if those bests contradicted each other at some point. And they’re exhausted. They’ve been doing their best, or they haven’t been for some reason or another. And it’s one month till graduation and we’ve got to figure something out because as it stands, one-third of our baby birds are about to fall hard and fast from this here nest. So we look to the sacred gradebooks. We evaluate the weighting of projects and essays and fiddle with recalibrating points and percentages. We consider extra credit and study groups and extensions and revisions. But what about all those chances they already had? What about the teacher who came in Sundays for months for the fistful of students who bothered to show up? What about the opportunities for purposeful relearning and growth they squandered time and again? If we rewrite history with our school community as the villain who failed them, and pass them along to colleges or the workforce, who are we serving? Surely not the students who haven’t actually learned the value of a deadline or that writing a powerful paragraph isn’t supposed to be easy. That teachers don’t give grades; students earn them. If we give in and say, well, yeah, we really could’ve, should’ve, needed to’ve done this better, let’s give them the benefit of the doubt, then our graduation rate stays within a respectable range and the overlords won’t come snooping. No one will ask why we’re dropout factory-ing the poor brown kids. And you know what, though? We need to ask this question. We need to ask it of ourselves, and of our schools, and of our cities and of our parents and of the students themselves. And we need to examine why they’re struggling to fly and work, as a community, as a city, as a nation, as a people, to fix it. It’s bigger than us, sure, but it’s also right in the palm of our hand. A hundred tiny, frantic hearts beating wildly and a hundred pair of tiny eyes staring wildly out over a foreign horizon. Our students deserve better than even the most well meaning nudge over that precipice.